Take a hike and explore one of the most beautiful ecosystems in southwest Florida, walking from Tigertail Beach Park parking lot on the new boardwalk, through the tunnel of mangroves, around the southern end of the Tigertail Lagoon, then heading north to the very tip of Sand Dollar Island “spit” that curls around toward Hideaway Beach, and then tracing your steps back. It takes almost three hours at a moderate pace; longer if you stop a few times taking in the abundance of wildlife that you can’t help but encounter. Once out on the “spit,” the area has an official state designation — the “Big Marco Pass Critical Wildlife Area” — but locals know and refer to it as Sand Dollar Island. It was an island, an ephermal sandbar, paralleling the beach off north Marco Island. The sandbar was a popular destination for boaters in the 1970s, ‘80s and ‘90s, and really was covered in sand dollars by the buckets full, hence its name. to erosion of the shoreline, a few dead, leafless mangroves and sea grapes are found. Now decorated with shells and messages from beach walkers, they have become autograph trees for memories. About a mile up the “spit,” due to erosion, a pathway leads off the shoreline into red mangroves, making one feel they are in a remote paradise taking an adventurous walk, and then all of a sudden the path ends on a wide expanse of beach sandwiched between the Gulf of Mexico and Tigertail Lagoon. Bird life is abundant in both bodies of water and on the sandy beach. You have reached the heart of the Critical Wildlife Area. The beginning of May, the first two sea turtle nests were found and protected, thanks to our sea turtle lady Mary Nelson and one of her new volunteers, Ray. The 100 or so hatchlings that will emerge from each of these nests in about 60 days will always call Sand Dollar Island home. It’s their natal beach. The hatchlings that survive will come back one day and create their own nests of sea turtle eggs here on Sand Dollar Island. The Sand Dollar Island “spit” was habitat for more than one-third of the Marco Island sea turtle nests last season. In the large expanses of sand between the lagoon and Gulf from April through August, Least Terns and Black Skimmers nest. 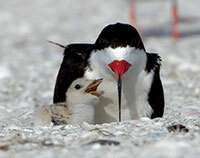 These shorebirds nest in large congregations, making lots of noise. Due to loss of habitat of sandy open beaches with some amount of vegetation that is not disturbed by upland development, there are fewer beaches along the coasts of the Southeast that satisfy their nesting requirements, but our Sand Dollar Island is perfect. There are large areas of sand, some vegetation for protection, plenty of bait fish in the lagoon and Gulf, and it is relatively quiet. These attributes have attracted more and more Least Terns and Black Skimmers in the past few years. This year looks to be very productive too. Aerial photo by Humiston & Moore Engineering Inc. taken September 2013.
areas each spring to protect the fragile nests, eggs and chicks. When walking, don’t stir up the birds (called flushing). They need to stay calm and on their eggs until they hatch and then to protect and feed chicks until they can survive on their own. If the birds are flushed and the fragile eggs and chicks are exposed, they are easily preyed upon by other shorebirds, crows and ghost crabs, and can bake in the sun in minutes. Please be sure to stay as far as possible from the posted area when walking by. When in this area, you may be greeted by a friendly Shorebird Steward — local residents who volunteer for a few hours on the beach near the posted shorebird nesting areas — who provide information on the birds and opportunities to view the birds and chicks through a scope. Continuing past the shorebird areas to the very northern tip of the “spit,” you will find you can almost walk to Hideaway Beach as the tip curls around and seems to be accreting more sand, stretching the shoreline closer and closer to Hideaway Beach. Look in the waters for dolphins and manatees who commonly swim by in these waters. This area is a very popular boater destination — the historical site of “Coconut Island.” Some Saturday afternoons, there could be dozens of boats beached on the tip and anchored behind Sand Dollar Island enjoying the clear, warm waters. 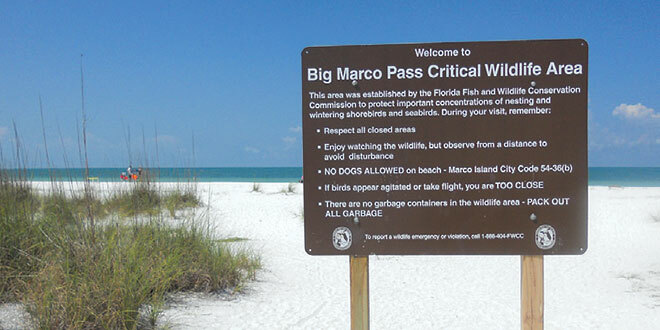 No dogs are allowed on Marco Island’s beaches, and this includes all of Sand Dollar Island. Please keep dogs onboard your boat and help conserve and protect this important, fragile and diverse ecosystem we know as Sand Dollar Island. Take a hike and explore the rich ecosystem of Sand Dollar Island! Remember to only leave your footsteps in the sand. Don’t leave trash or beach equipment. Take it home! If interested in more information about Marco Island’s beautiful beach and wildlife or would like to volunteer as a Collier County Shorebird Steward, please contact Nancy Richie, the city of Marco Island’s environmental specialist at nrichie@cityofmarcoisland.com or 239-389-5003. For more beach and bird information, please contact Nancy Richie, City of Marco Island, at 239-389-5003 or nrichie@cityofmarcoisland.com.